Reading: John 2:19; Eph. 2:1-6; Heb. 9:11,12; 21,22. I have it on my heart to say a few words about the twofold testimony of the Blood of the Lord Jesus. I think we may have long since recognized that the great truths upon which the whole system of New Testament Christianity rests are the cross and the resurrection of the Lord Jesus. From the very fall of man, everything of the revelation of truth or Divine institution bore reference to these two things. We may even say, and I think quite truly, that with a view to these two things, the whole course of this world in respect of God's Divine government has been arranged and ordered; that is, to these events everything has led; for these events everything waited, and upon them everything in the history of this world turned. God's governing and ordering of this whole world's history has been made to revolve upon the pivot of the death and resurrection of the Lord Jesus, and when everything is finally summed up in the presence of God, all will be dealt with in relation to those two great truths. They will be that by which all is judged and everything is determined. The history of the ages, from the point of view of God's government and purpose, revolve upon the death and resurrection of the Lord Jesus. 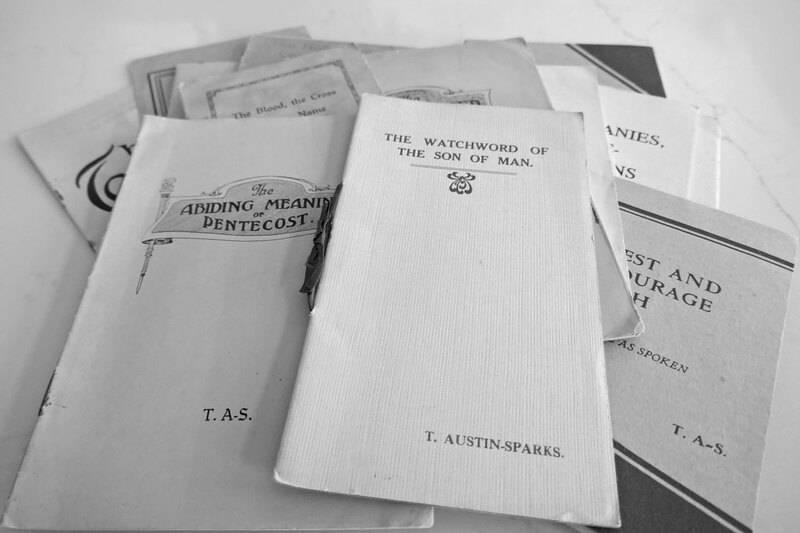 When you begin the preaching of the Gospel from the time when these things were fulfilled, you find that so far as the first few chapters of the book of the Acts are concerned, they are little more than a witnessing to the death and resurrection of the Lord Jesus, with special emphasis upon the resurrection; not that that was more important but that involves the other. You do not have resurrection unless you have had a death. And so you find that those first chapters, which are the preaching of the Gospel at the beginning, are almost entirely occupied with testifying to the resurrection of the Lord Jesus. Wherever you read you find that that is the main note that is being struck. Now, the central symbol of the death and resurrection of the Lord Jesus (and these are the two things upon which the whole of New Testament Christianity rests) is the Blood of the Lord Jesus Christ. That, of course, carries with it the Person of the Lord Jesus as to Who He was, but the central symbol of Christianity as we have it in the New Testament, or if you like, of the Gospel which was preached, is the Blood of Christ. It is, therefore, very important that you and I should understand the meaning of the Blood and its value; and it is in this connection that I want to say just a word or two by way of just a fragment of the whole thing. Much has been brought before us in the last passages which we read in the letter to the Hebrews and they would take us back to the other passages where, in the letter to the Ephesians, the death and resurrection of the Lord Jesus is brought clearly into view, and our union therewith. Then back into John chapter two. It is interesting and significant that so early in his record, not at the end, but right at the beginning of his record, John puts this great foundational thing: "Destroy this temple and in three days I will raise it up." All these passages are one in principle. What is the basic principle of the Blood of the Lord Jesus and therefore of the Gospel, or to use the larger word, of New Testament Christianity? It is the principle of Life in Christ. The Blood of the Lord Jesus is, we are made very clearly to understand, the symbol of His Life, that which speaks of His Life, and all that we have to do with the Blood relates to that. Here in this letter to the Hebrews, which is a gathering up of so much of the Old Testament, especially the book of Leviticus and other parts, as of Exodus, the Blood is more prominent, it is in view all the time, and we see here the Blood having been shed and gathered, then sprinkled on everything. I would like you just to get the clear representation in your mind's eye. There is the sacrifice. It is brought to the door of the tabernacle, and then having been proved an acceptable sacrifice inasmuch as no spot or blemish or any such thing is found in it, it is slain, its blood is shed, it is killed. But a special office, more honourable even than slaying the sacrifice is given by rota to some of those who are acting for God and His people in priestly ministry, to receive the blood. More than shedding is receiving of the blood an honour. The receiving of the blood in a vessel is marked as a special stage in the Divine order. That blood is taken and then it is sprinkled initially upon that whole system. Every detail of that whole system has to come under the sprinkling of the blood; from the door, the altar of burnt offering, all its vessels, the laver, its base; then the curtains of the tent; the door of the sanctuary; all the vessels of the holy place; the veil between; and then in the most Holy Place the High Priest sprinkled the blood upon the mercy seat; upon all the priests, themselves and their garments; and everything that is used, or had a place in the representative system came under the sprinkling of that shed blood, and blood is everywhere. Why is so much prominence given to the blood? For the simple reason that it does represent the life, and that even these things which are made to represent Divine thoughts and ideas, cannot be made effective for the Lord's people until they have been touched with Divine Life. And beloved, you have got God's thoughts in that Book. Now, you may sit down and read that Book, and know all that is contained in that Book, the thoughts and ideas of God, and when you have read the Bible through like that, and know all the thoughts of God, you may still be spiritually dead from the Divine standpoint, according to the Divine interpretation. You may be no better. You may get a kind of elevation of thought, but you will not be alive. There is all the difference between elevation and resurrection. A lot of people get elevation from Christian ideas. Christian ideas have lifted people in a certain sense, worldwide, but that is something far short of resurrection. And so, even these expressions and thoughts of God as represented in all the details of the tabernacle, needed something more to make them living, active and functional, so that they come into effect, into operation; and the movement from an expressed thought to a living and effective activity in the mind of God is marked by the sprinkling of the blood. It is a transition from a dead system, although a God-given system, to a living, God-given system. Christianity is not the acceptance of a whole system of ideas. It is the acceptance of a Life and that Life carries with it the thoughts of God, so that the thoughts of God become living, not merely mental, but spiritual. And the sprinkling of the blood was that act which marked a transition from death unto Life, and things became effective at that point. The priests could not function until the blood of sprinkling had touched them. So that blood being everywhere speaks of Life. We know quite well that the blood is the life. We know that in common happenings, in certain cases of extreme need where blood is taken from one person and given to another, it is not in order that the one who receives it should have so much red fluid put into their veins, it is because in the blood there is the life principle. And I am told by authorities on the matter, that the blood can be taken from one living person and put into a vessel, and while that blood remains warm there is life in it, and it can be taken from that vessel after having passed perhaps some miles, and can still be of value because it is not just the fluid but the life principle in it. The Lord takes the blood as the symbol of life, as having in it the secret of the law of life; and seeing it is the Blood of the Lord Jesus which becomes the symbol of Life, we do not think of course of the actual fluid of the veins of Jesus of Nazareth, we think of what is represented thereby spiritually. But we must remember that the actual pouring out of His Blood meant something in the Divine mind. We sing our hymns about the Blood of the Lord Jesus, and we relate all that to the nature or the meaning of His death, and we see that it is in His death that we have the value of His Blood, because it was there shed and carried through as a memorial into the presence of God as something done for us. Now, the death of Christ is necessary for several reasons. First of all, as we open our Bibles we find that man is regarded by God as being dead; not some men, but all men. Spiritually dead, that is, severed from life in God. This passage from Ephesians 2 assumes it, takes it for granted: "And you... when ye were dead"; "...even when we were dead". Well, that is the position which is taken for granted by the Word of God; man regarded as dead. Now, in the death of the Lord Jesus He identified Himself with man's state, voluntarily, but He did that. He identified Himself with man in his state of death: "Him who knew no sin He made to be sin on our behalf...", voluntarily taking that which resulted in death; and so He identified Himself with man in his death by being made sin. Therefore the death of the Lord Jesus was necessary in order to bring Him into identification with man in his death. Remember that while we lay a great deal of stress upon our identification with Christ in His death, we have to begin the other way round; before that He identified Himself with us in our death, and through the Scriptures you come upon many illustrations of this truth. One classical illustration in the Old Testament is of the prophet and the widow's son. You remember the son of the widow died, and the widow would have none other but the prophet in her need, and compelling him to come, she poured out her heart, her trouble; and he took the son up into his own prophet's chamber and laid him on the bed. And we are told he stretched himself upon this son, putting his hands to his hands, his feet to his feet, his lips to his lips, and called upon the Lord. There is the figure of identification with the state of this son. He has, as it were, entered right into that position, identified himself with it and with that one in death. Yet, by a union of his spirit with God, a grip which he had upon God in heaven, he could go down typically into that death and identify himself with it, and drag that one clean out of death. On the one hand, one with him in death; on the other hand, one with God in life. That is the other side of the Lord Jesus; that while He, being made sin for us, came into our state and spread Himself upon us in death and became united with us in our state of death, there was another side of His Being which was not true of us, only true of Him, and He only could do this because He was God. The other side was He had that Divine Life, Divine hold and grip upon Life that could not see death, and in the power of that He came down and in His death He destroyed death. In His identification with us in our state, He destroyed our state and lifted us out of it. The death of the Lord Jesus was necessary in order to bring Him into the state of those He was to save and deliver: man being recognized as dead, He must therefore come into that state with man. But then there is the other side, where, because He was not sinful Man, though made sin, in Himself sin was not inherent, He could not be destroyed by death, but He could enter into death and destroy it. He overcame death. But we are emphasizing the death of Christ as being necessary, and it was necessary for that reason in the first place. Now, so far as we are concerned the Lord never did, and He never does, raise the old and judged man. The Lord has not, in His overcoming of death and entering into our state and bringing us out, raised the old man that was judged and that died. God must have a new Man, and here is another phase of the death and resurrection of the Lord Jesus: God having a New Man after His own heart. And Christ is that Man. And therefore, you find that the emphasis all the way through the New Testament is, concerning the Lord Jesus, "God raised Him." What is it that God has raised? He has raised Jesus Christ. But then it says: "...and raised us up with Him", but if you look at the position of the raised, you will find that it is "in Christ" not in ourselves, not in what we were, but now in Christ, that is, representatively. God raised the Lord Jesus as the One after His own heart and He has never raised the old, judged man of the fallen creation and He never does. Christ satisfies God's heart, but death was necessary on His part if He was to be the Representative of a new creation. In order that all that was due to that creation by reason of sin, should be fully dealt with in judgment, He died. Now here we read in Hebrews 9:27,28: "And inasmuch as it is appointed unto men once to die, and after this cometh judgment; so Christ also...". That is a text often preached to unsaved people in Gospel Missions: "It is appointed unto men once to die, and after this cometh judgment", usually intended to scare men a bit into Christianity; but this in the first place was not written to unbelievers, but as recorded here it is for the saved people. The apostle is telling Hebrew believers of the value and glory of their faith. "And inasmuch as it is appointed unto men once to die, and after this cometh judgment; so Christ also, having been once offered to bear the sins of many, shall appear a second time, apart from sin, to them that wait for Him, unto salvation." You see, in His death He took not only the state of man, but the afterward of that state. This is one of the most precious parts of our whole faith, which we are enjoying so much now. It is this: that in the resurrection of Christ, or in Christ raised from the dead representatively, the judgment is passed for believers. By nature God regards us as dead in that spiritual sense, but that is not all. We are going on to judgment. The whole of this world outside of Christ is going on to judgment. It is dead, and judgment comes. Do not think of this death as being merely the passing from this present world. That is how it is used in the evangelistic world today, that if you meet with an accident and you are killed then that is judgment. No! You may live three score years and ten and more and just die an ordinary kind of death, a fading away, but you are going to meet judgment, not because you pass from this world, but simply because you are already dead and judgment is in store for us as now being dead; dead according to God's thought about that. That makes a great deal of difference, but there is One Who has come into this state of death and has anticipated all that which lies ahead for man of judgment, and has had that judgment meted upon Him for all men who are dead. He has taken the afterward of this present spiritual death and when He is raised, He is raised as a Man Who has died and been judged after death, Who has received everything of the judgment of God in death and through death. These two things were met in the hour when the Lord Jesus cried: "My God, My God why hast Thou forsaken Me?" Death and judgment were in the cup He drank, there brought together. Raised then, for Him there is no more judgment. I know Paul says, "For we must all appear before the judgment seat of Christ", to receive what? There is all the difference: "that every one may receive the things done in his body, according to that he hath done, whether it be good or bad". The Lord Jesus Himself said concerning the resurrection of the dead: "they that have done good, unto the resurrection of life; and they that have done evil, unto the resurrection of damnation". Edited and supplied by the Golden Candlestick Trust.